Recently, when I was cleaning my attic, I came upon an old and dirty suitcase that had been sitting there for over ten years. I picked it up to see it’s condition and felt that it weighs A LOT. I compared it with my current suitcase, and I was shocked by how much more lightweight it was. And so it got me thinking: What’s the average weight of an empty suitcase nowadays and what’s considered heavy and what lightweight? I couldn’t find a good answer, so I decided to write my own post, as this could likely help out someone who’s looking for new luggage. You can see the results that I found below. How much does an empty suitcase weigh? Hardside vs softside luggage: Which one is lighter? Is lightweight luggage worth it? The average weight of an empty suitcase is about 9 pounds (4.1 kg). To determine the average mass, I compared at least ten different popular suitcases in each category: carry-on, medium checked, and large checked. I included both hardside and softside bags. The average weight for an empty carry-on is 7.9 pounds (3.6 kg). From 20-21 inches, the most popular options weighed between 6.3 to 10.2 pounds. 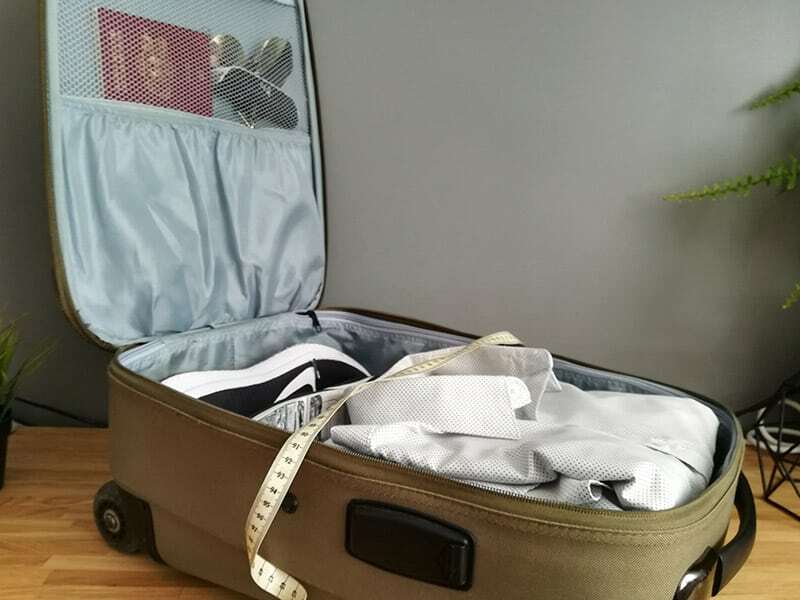 The average weight for an empty medium-sized checked suitcase is 9 pounds (4.1 kg). From 24-25 inches, the most popular options weighed between 6.9 to 12.6 pounds. The average weight for an empty large-sized checked suitcase is 11,9 pounds (5.4 kg). From 28-29 inches, the most popular options weighed between 7.8 to 17.3 pounds. When comparing hard suitcases with soft ones, I saw a clear correlation between the total weight of the bag. On average, hardside suitcases weighed two to five pounds more, than their softside alternatives. However, I do have to note, that some hardside suitcases were not that heavy at all. The ones made from ABS materials were the lightest, in contrast to their alternatives that are made from polycarbonate. Also, some options made from PET materials were pretty light. If you’re looking for the most lightweight option, you should look for a fabric suitcase as they’re always lighter. In my opinion, yes. Especially, if you’re living in Europe and tend to fly with budget airlines. It’s a deadly match if you’re equipped with a heavy suitcase, as Europe budget airlines have really strict luggage weight restrictions. It’s an excellent way for them to compensate the low profits from tickets by additional fees for checked and hand luggage. Some budget airlines have their weight restrictions for hand luggage placed at fifteen pounds. If your carry-on weighs ten pounds, you’re pretty much doomed. I’ve seen some lightweight luggage starting at just four pounds, which is just ridiculous compared to the alternatives weighing twice as much. Also, most common brands that provide lightweight luggage are It luggage, Lucas, Skyway luggage, and Travelpro. Editors tip: If you’re looking for a new suitcase, I recommend choosing a well-known brand that suits your needs. There are so many brands to choose from and each with their own unique characteristics, like lifetime warranty, durability, French design, lightweight and so on. 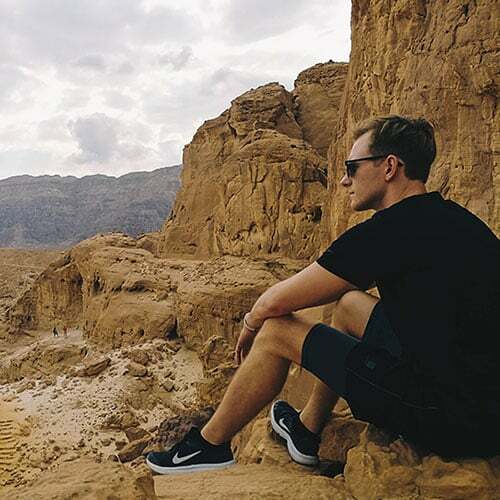 Here’s a comparison of the 16 most popular luggage brands that will help you compare the most popular brands and help you choose the right one. If you’re purchasing a lightweight suitcase above 70$ and from a well-known brand, usually you’ll get a durable one. Just be sure to look at the reviews before buying. You want to find something that had hundreds of reviews and most of them positive. Most lightweight fabric suitcases are made from a durable rip-stop polyester material, with the frame made either from aluminium or fibreglass. Usually, they feel pretty fragile upon picking up, but the good ones will last. Here’s a piece of advice: Always pack lightweight fabric suitcases full, otherwise, the inner frame could get bent. 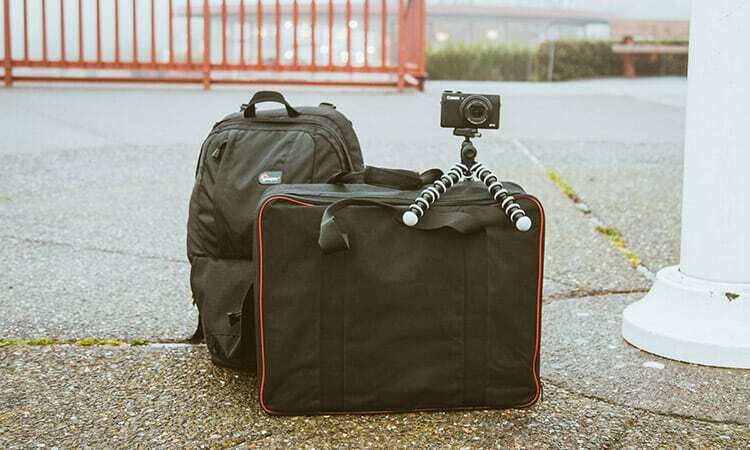 On the other hand, if you’re looking at purchasing a hard shell lightweight suitcase, always go for the polycarbonate frame, as opposed to ABS. The latter is much more fragile and cheaper to manufacture. Here’s what the weight restrictions usually look like for carry-on luggage. If you need to find any other airlines, here’s a post by Skyscanner that shows just that. Some restrictions might be inaccurate if a company changes their policies, but I try to update this list as often as possible. Here’s a list of the weight restrictions for checked luggage for the most popular airlines. If you can’t find a specific airline, you should check the airline companies website. Some restrictions might be inaccurate if a company changes their policies, but I try to update this list as often as possible. Okay, so now you know how much is considered heavy and what some lightweight options weigh at. If you haven’t already, here are a few different ways on how you can weigh your luggage. Also, this could be handy for your return flights, when you know what’s the limit and you’re trying to figure out how much sweets and souvenirs you can still pack in your already over-packed suitcase. If you have the luxury of a proper scale, weighing luggage is pretty easy. Stand on the scale without luggage, note down your weight. Pick up your suitcase and weigh yourself again. You get the correct weight of the suitcase by subtracting both numbers. Now here’s a neat little gadget that could get handy if you’re frequently travelling. It’s called a luggage scale, and you can get one for about ten dollars. So how does it work? You turn it on, wrap the strap around a handle of your suitcase and pick it up by holding the luggage scale. 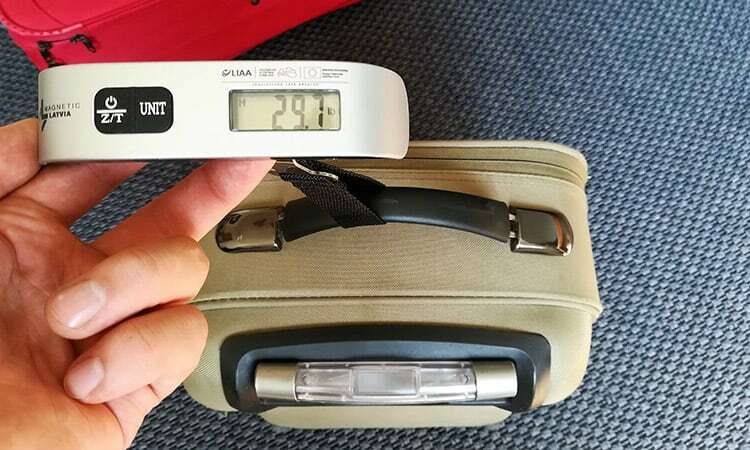 It’s an easy way to weigh your luggage at hotels and airports, as it’s really tiny and you can get an accurate measurement in just a few seconds. Also, the measurement is usually really precise with two digits after pounds. I didn’t use one before, and to be frank it’s not one hundred per cent necessary for everyone. However, it’s a really cool item to have for frequent travellers who are flying more than ten times per year. It’s just way easier. Unfortunately, you can’t get an accurate measurement of the suitcase weight without any scales. However, there are a few things you can do. First, you could compare your luggage to other objects which you know the weight of, like dumbbells, five litres of water and so on. You won’t get an accurate measurement this way, but it can give a rough estimate. Second, you could postpone your weighing to the airport. If you see an empty check-in desk, weigh your luggage on the scale near the check-in. I’ve done this several times, and nobody has stopped me. Alternatively, some airports have weigh-in stations, but they usually cost one or two dollars.